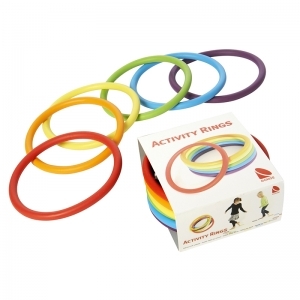 Set of 6 bright Activity Rings appeal to children of all ages — as well as grown-ups. 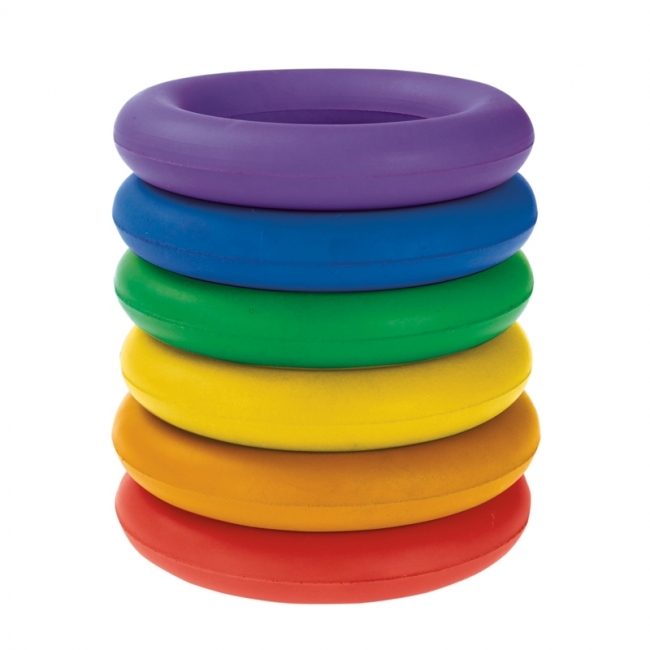 Activity Rings inspire countless activities like balancing rings on the head, juggling rings on arms and legs, and throwing rings to each other. The possibilities are limitless. Activity Rings invite spontaneous play as well as structured activities including games, music/dancing, and physical education. 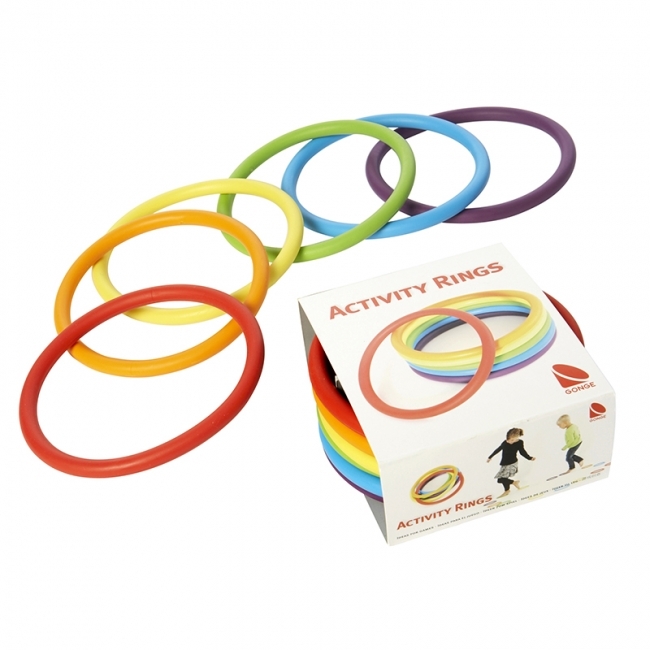 Activity Rings encourage individual, as well as, social activities. Made from artificial rubber (TPE). Sold in six color assortments. 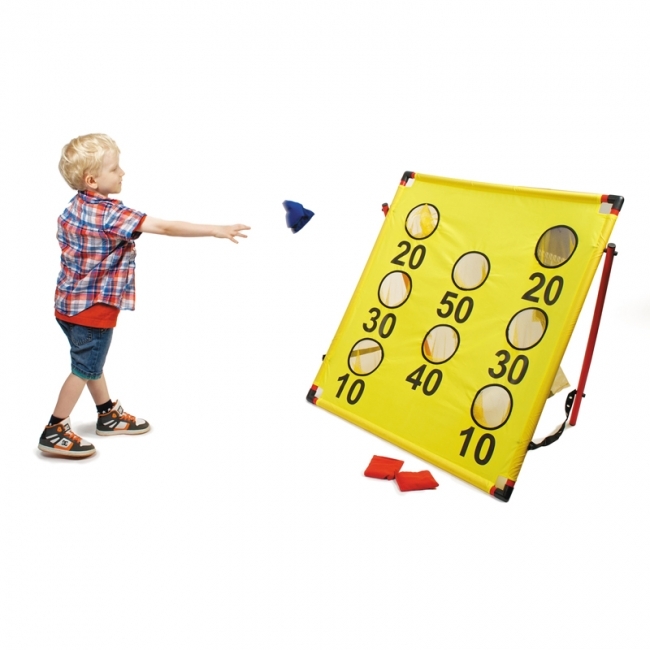 Portable bean bag target toss game is great for all ages to teach aim and coordination. Printed points are easy to read on targets. Made of durable fabric polyester with mesh pockets and plastic stand. Set includes target and 12 bean bags. Easy to assemble. Sponge rubber rings are brightly colored, sturdy and easy to grasp or hold. Won't scratch or mark floors, so they're perfect for indoors or out. Made of solid sponge rubber. Measures 6"W. This set includes 6 rainbow colored deck rings. Play indoors or out. 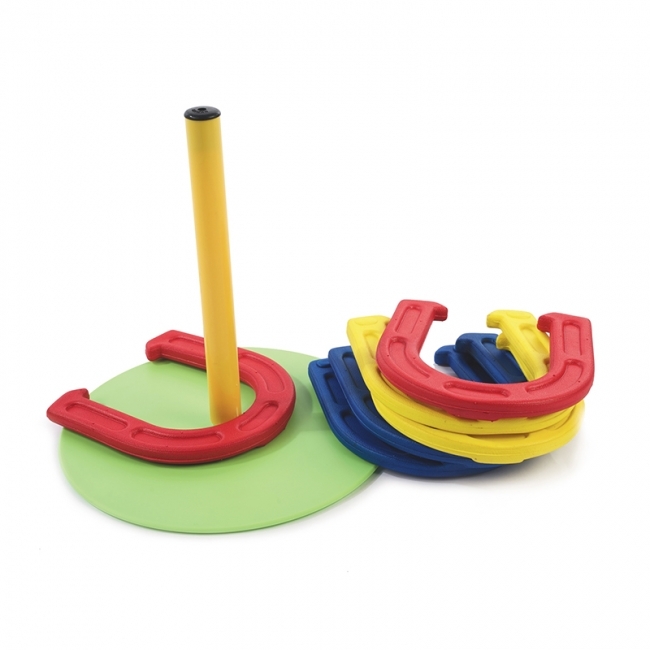 Sponge foam construction for the horseshoes allow for a little bit of weight to mimic an actual horseshoe, but is safe for use for even the youngest players. 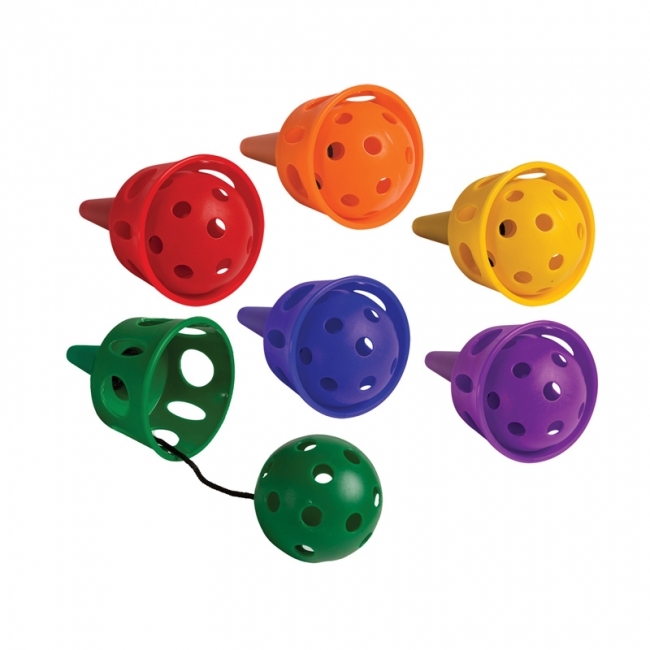 Target pegs sit on flat weighted bases so they can be placed anywhere on any surface. 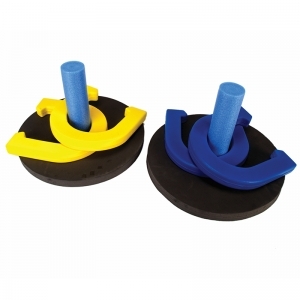 Set includes 6 sponge foam horseshoes (2 yellow, 2 red, 2 blue) and 1 target peg. Designed for all-ages fun, the solid wood Champion Sports Ring Toss Set will bring some friendly competition to your backyard, camping trip or tailgate party. 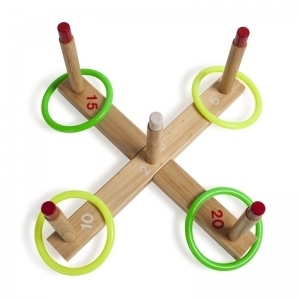 The classic game of ring toss helps youngsters improve their hand-eye coordination, precision and accuracy in a simple two-player game. 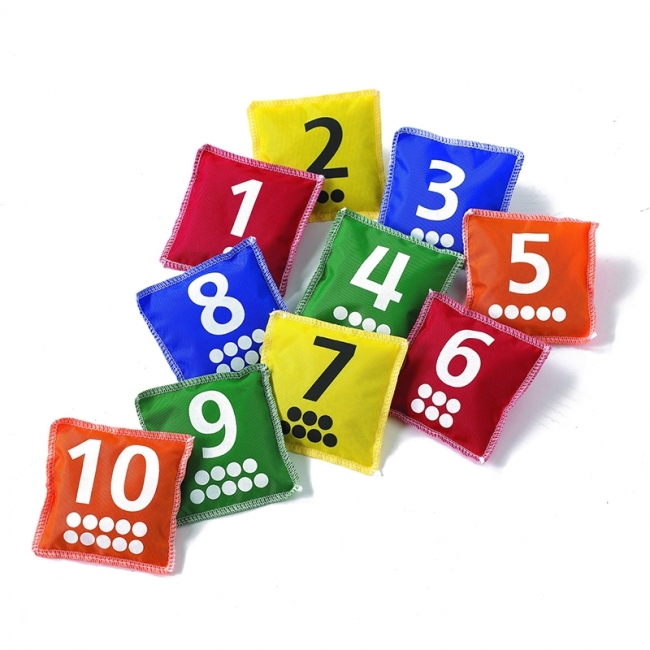 Scorekeeping is easy using the labelled base, and non-abrasive plastic rings mean you can play the game inside when the weather turns. Colorful 4" (10cm) bean bags offer many options for learning and play. Great for developing gross motor skills. Numbers 1-10 and respective dots are printed in white on one side of nylon bags in 5 colors. 10 pieces in a set. 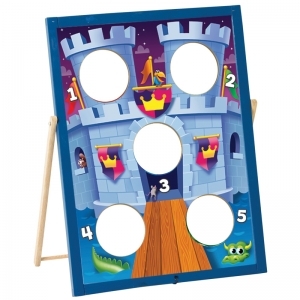 Kids will love tossing around their ABCs, learning letters, and building words. 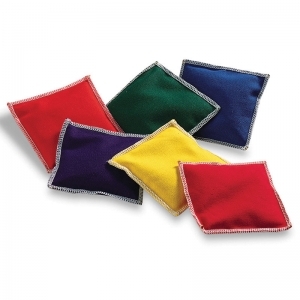 Each of the 26 bean bags is made of soft, cuddly felt. Bean bags are embroidered with uppercase letters on one side and lowercase letters on the other. Letters are color coded, consonants in blue and vowels in bright red. Comes in a convenient drawstring bag. 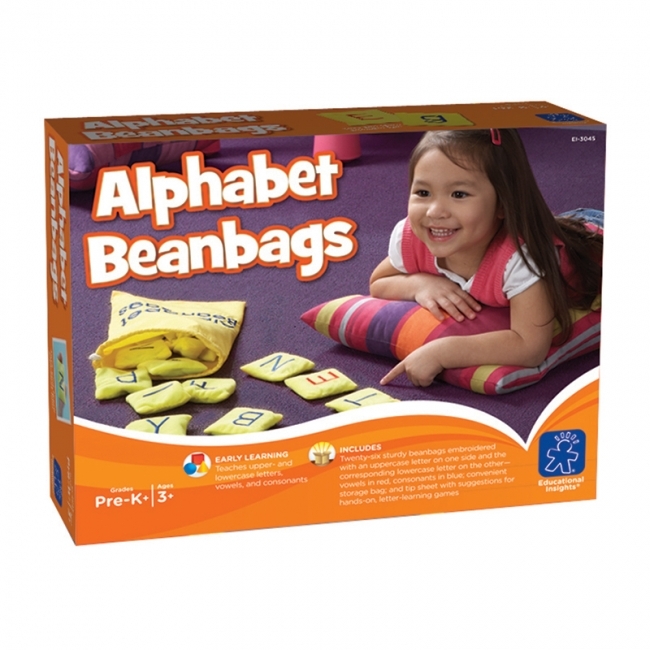 Includes a Tip Sheet with great suggestions for active, hands on alphabet games. 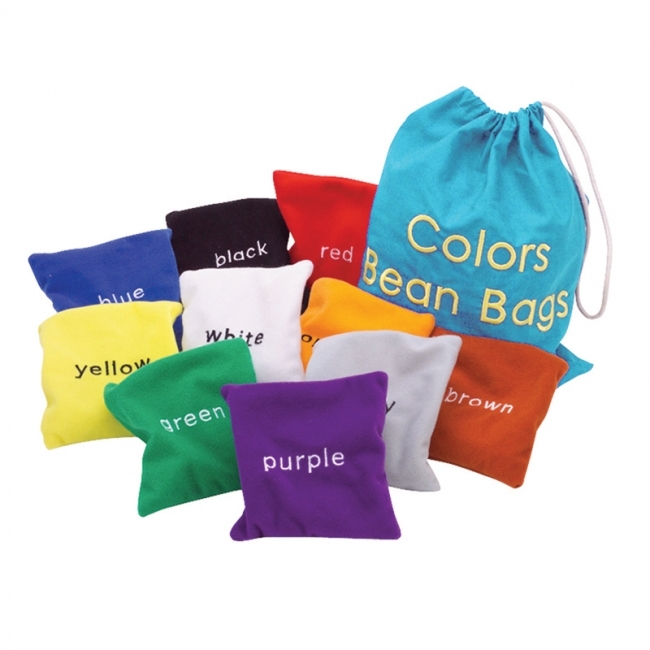 Kids will love learning their colors and color words with this rainbow of beautifully embroidered felt bean bags in ten cool colors: red, blue, yellow, green, orange, purple, brown, black, gray and white. 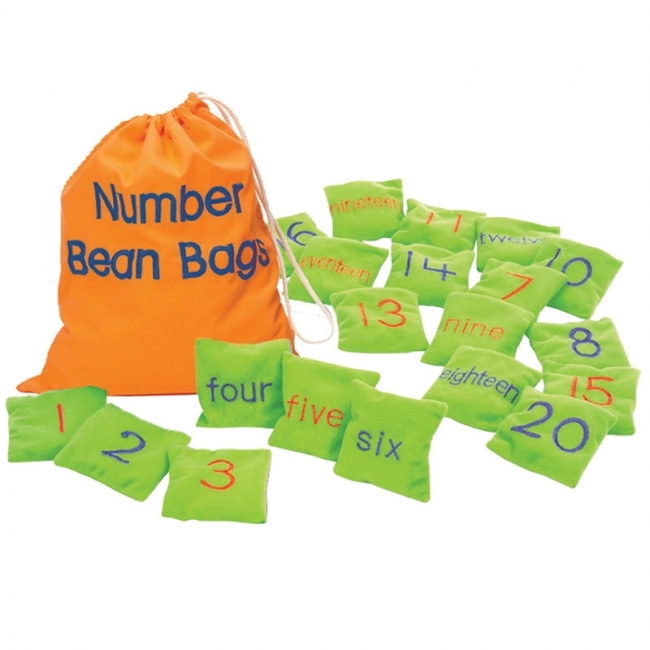 Each bean bag measures 4" x 4.25" - the perfect size for small hands - and stores conveniently in its own drawstring cloth bag. 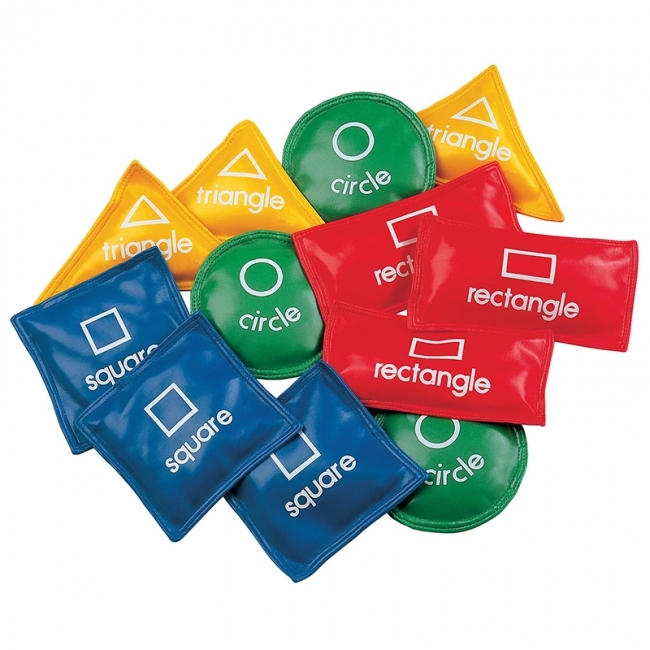 Includes a handy "Tip Sheet" with fun color identification and coordination games and activities. 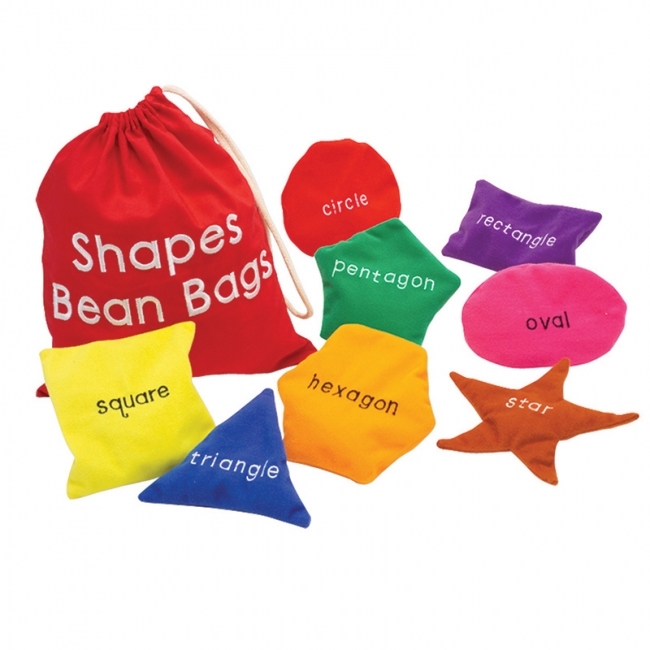 Bean bags are a favorite among kids for all sorts of home-made games. This set of six durable, canvas square bean bags comes in a rainbow of colors. 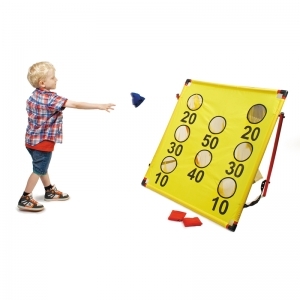 Great for developing gross motor skills. Includes suggested activities, and comes packaged in a reusable storage container.